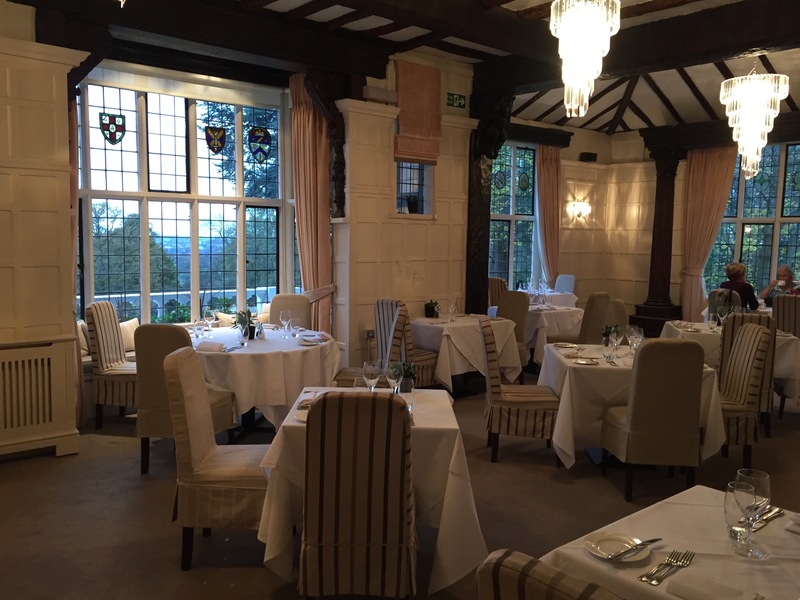 Having driven past a few times, I was keen to experience the intriguingly named Laura Ashley Manor Hotel in Barnet Lane near Elstree, so on my birthday I headed there with my mother for some lunch. This hotel was previously known as the Edgewarebury Hotel before being taken over by Laura Ashley Hotels (they have another in the Lake District). The building has no link with Laura Ashley herself, but it is an opportunity for the company to showcase their interiors range. From looking at the website and especially noting the prices charged in the Cavendish Restaurant, the hotel is pitching fairly high on the dining front. Lunch is the same price as dinner: £22 for one course, £29 for two and £35 for three. 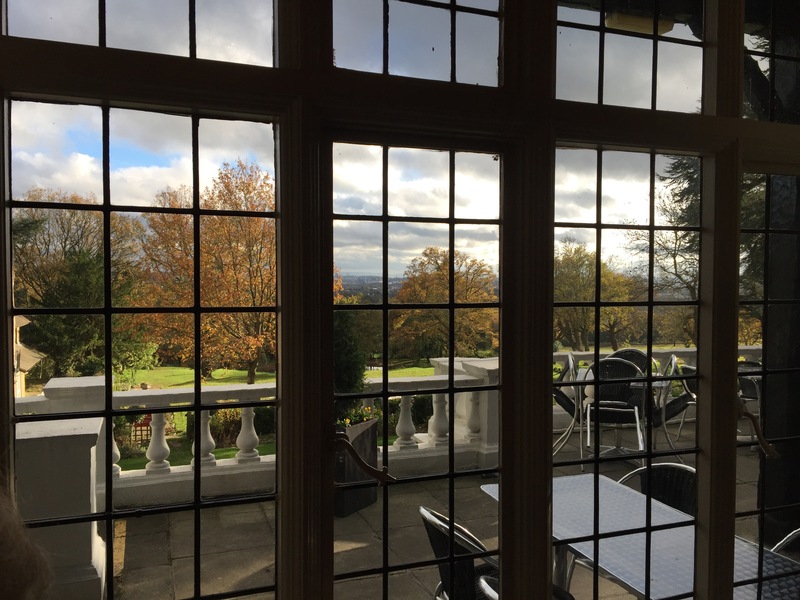 We didn’t need a full blown formal lunch (or to pay these prices at lunchtime unless we were in Michelin starred territory) and afternoon tea was tricky due to the school run, so we opted for lunch in the bar with its promise of panoramic views of London. The black and white half timbered building is at the end of a long drive through attractive woodland. Apparently the house dates back to the 16th century, but it feels as though it had an Arts and Crafts makeover about a century ago and it has a modern annex. 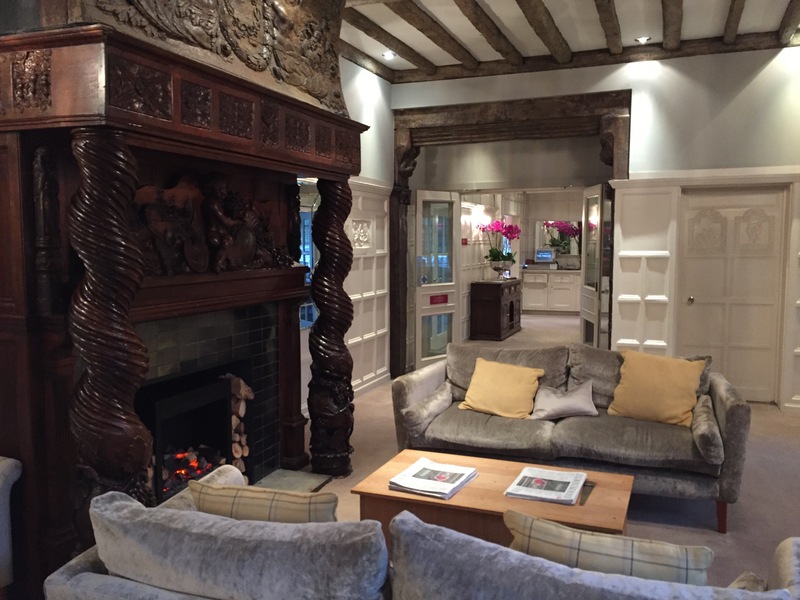 There are some seriously old carved wooden features and much of the panelling on the walls has been painted cream which helps to lighten up and feminise the space. 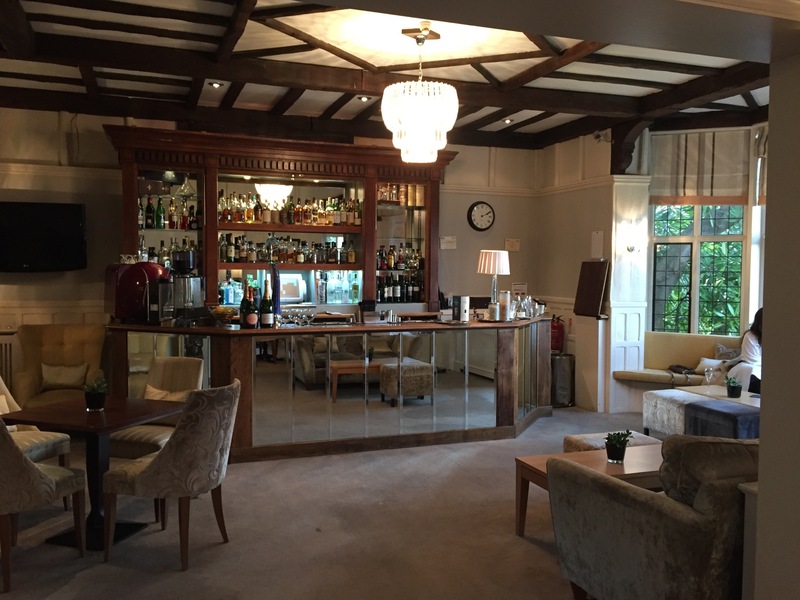 Laura Ashley have done decent job with the furnishings and updating the building, but in some cases the style is rather too Art Deco with bevelled mirrors jarring with the original fittings and all the exposed beams. It was interesting to speculate what a brand like Liberty, for example, would do with such a characterful property. 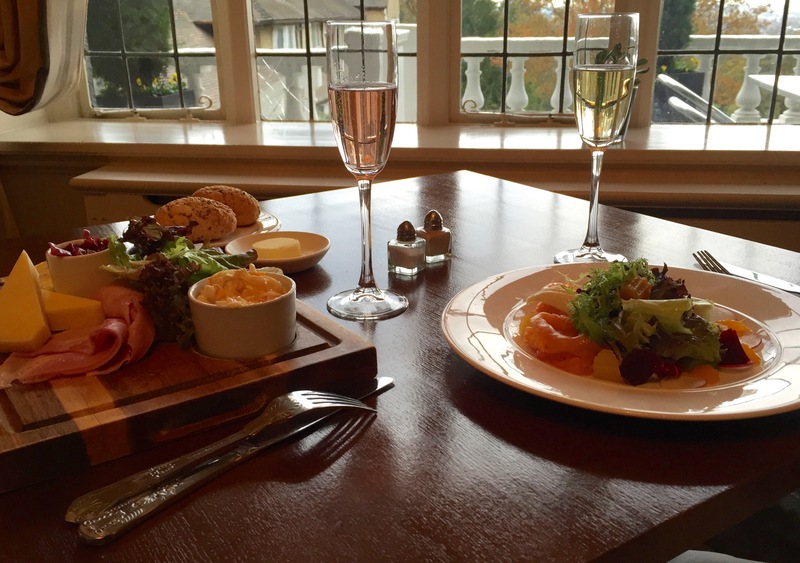 However, the staff were friendly and welcoming and after we’d rearranged the furniture to make the most of the impressive outlook (and to avoid sitting on grubby seats) we ordered a ploughmans and smoked salmon and beetroot salad with a couple of glasses of fizz. The bar menu also includes hot dishes like burgers, fish and chips, steak, and grilled salmon, as well as a range of Malaysian dishes. Apart from our bland (defrozen?) bread rolls (decent artisan bread is now widely available), the food was good and portions were generous. They even presented me with a ‘birthday plate’ with some beetroot cake and a fruit tartlet, a lovely gesture that we enjoyed with some decent coffee. The the cocktail list read well, but, fizz aside, the wine selection in the bar menu was a bit tame with several branded bottles and the service could have done with a bit more polish and purpose. However, it was goodhearted and the atmosphere was warm and restful and our lunch was decent value coming to about £45. I might be tempted to return one evening to try out the restaurant, but sipping drinks in the bar with the twinkly view is much more likely. It was good, but it has the potential for much more.